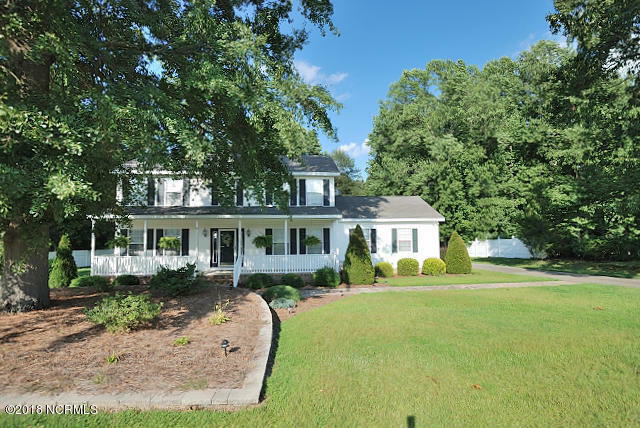 Wonderful 2 story home with .94 acre lot. Front porch sits across the entire front of the house. Spacious great room with fireplace. Kitchen has bar and stainless steel appliances - including gas stove. Overlooks deck, patio and back yard. Home has 4 bedrooms, 2 1/2 bath. Upstairs has beautiful heart of pine flooring continued under the carpet in two bedrooms. This home has lots of storage and space for everyone! The outdoor life can be enjoyed either on the deck or patio by the fire pit! 2 car garage provides a utility sink and walls of built in storage. The front yard is provided with an irrigation system that is metered separately and elegant landscape lighting to accent the brick walkway going to the front porch. Alarm system is also part of this great package!